The Celestia Grand is located on the edge of the caldera, in Fira. 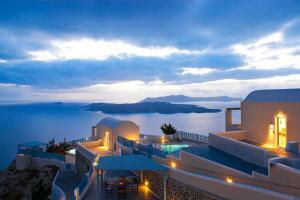 It offers luxury villas with a private pool and a hot tub with great views of the volcano and the Aegean Sea. The airport of Santorini is at 3 km. This villa has a minimalist décor and a private pool with views of the caldera and the volcano. It includes a flat-screen TV, DVD player and free toiletries. This villa has a minimalist décor and a large terrace by the cliff with a private pool overlooking the caldera and the volcano. Includes a spa bath, flat-screen TV and free toiletries. This honeymoon villa has a large private pool with views of the caldera and the volcano. It has a flat-screen TV, DVD player and free toiletries. This villa has a minimalist décor and includes a sauna and a private pool with views of the caldera and the volcano. It includes a flat-screen TV, DVD player and free toiletries. This villa has a minimalist décor and a large terrace by the cliff with a private pool and views of the caldera and the volcano. Includes a spa bath, flat-screen TV and free toiletries. This villa with minimalist décor has a cliff-side terrace with a small pool overlooking the caldera and the volcano and is equipped with a handmade spa bath, a king-size bed, a flat-screen TV and free toiletries. This villa has a balcony, seating area and spa bath. This villa has a balcony, spa bath and sea views.